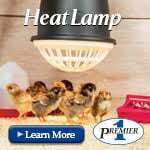 Is there such a thing as egg laying etiquette? I’ve often wonder about this. 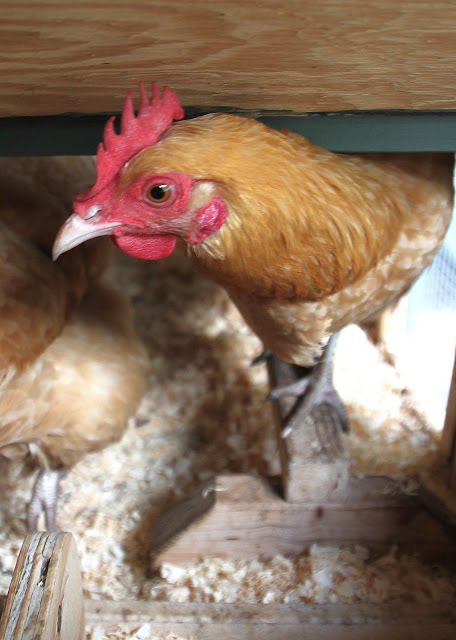 I have heard stories of hens lining up just to lay their eggs in a favorite box, each patiently waiting until the hen in front of them has had her turn. 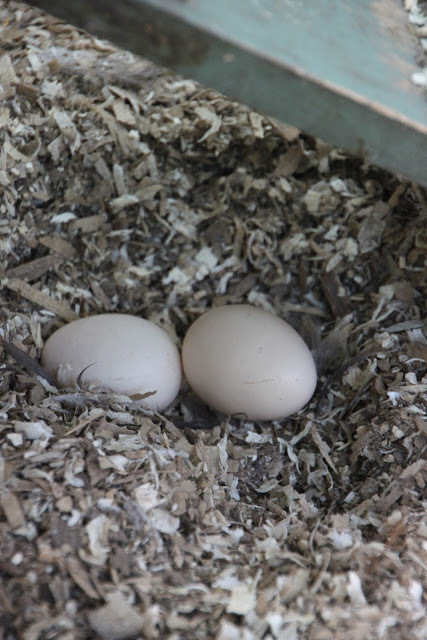 Often in our nesting boxes, I will discover two chickens laying their eggs at the same time in the same box. It is so cute to see them stuffed into the box, chatting together and singing the “egg song” duet. It must be a bonding experience and one that they enjoy as I discover them this way quite a bit. However, yesterday things were a bit different. I was enjoying spending sometime outside with the girls in the morning. As most everyone was scratching around in the fresh moist dirt I saw that Fifi had to lay an egg. She popped up the ramp and into the coop to have her pick of all the nesting boxes. 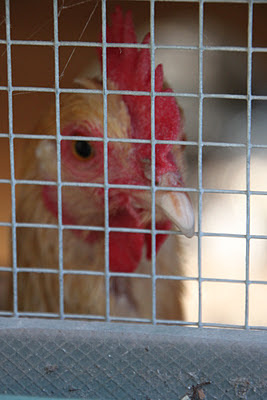 No sooner had she entered the coop, I saw Sunshine make a bee line inside and shoo her out. This happened repeatedly with lots of squawking and feathers flying. Fifi came out almost as soon as she went in. Poor little Fifi, all she wanted to do was lay her sweet tiny little egg in one of the boxes. She would even take the middle one if forced to. 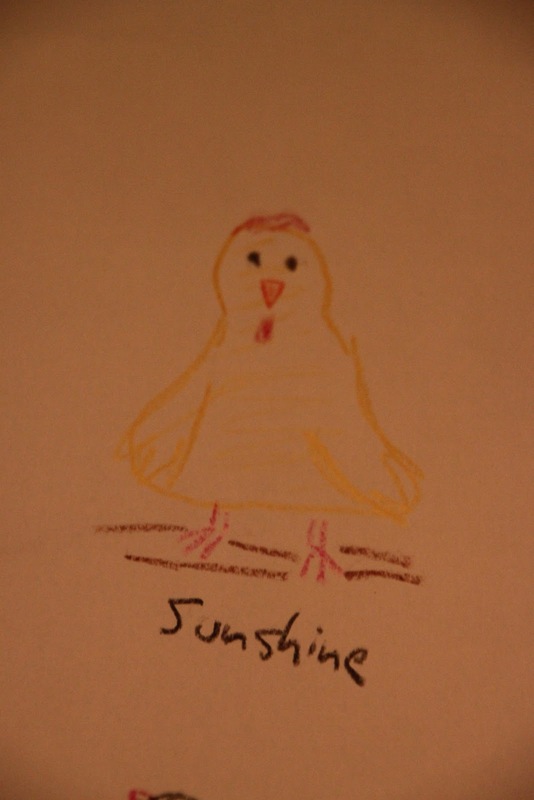 Why didn’t Sunshine understand? Why was Sunshine so bossy all of a sudden? Then it dawned on me. Sunshine was bossy. Clearly this otherwise docile chicken had begun to transform. With Tilly being on and off broody, Sunshine has bestowed upon herself the position of head hen! At first it began with some naughty behavior, like eating eggs (thank goodness she stopped), completely emptying the feeders and bullying the others away from treats. What had gotten into her? Power. She had control and she liked it. She could do good and naughty and no one was there to stop her. Her rule is so different from sweet Tilly’s. I intervened that morning. I tossed some black sunflower seeds into the run to provide distraction. Sunshine quickly commanded the scene, gobbling up as many as she could. 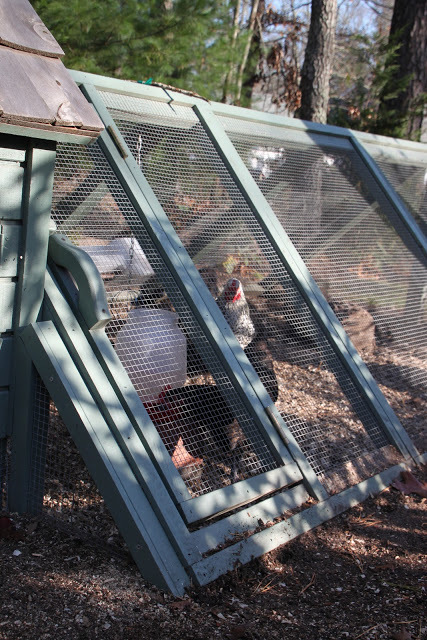 Fifi took note and ran into the coop and hid in the nesting box on the far left, the favorite one. I had bought Fifi about 5 minutes. Soon enough, Sunshine noticed that Fifi was missing. She marched on into the coop. She saw Fifi in the nesting box on the left and determined she decided to occupy the box on the far right. I returned to the coop about a half hour later to discover Tilly back inside sitting in the middle box with Sunshine’s and Fifi’s eggs underneath of her. She had been busy. 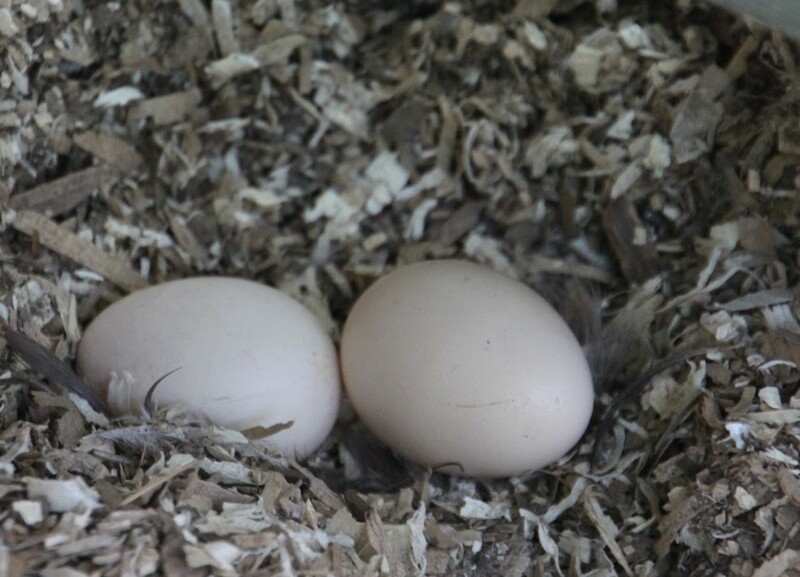 With her beak, she carefully rolled each egg out of their respective boxes and into her favorite box, the middle one. With feathers puffed and some cautionary growls from Tilly, I reached underneath of her and retrieved the two warm gifts. 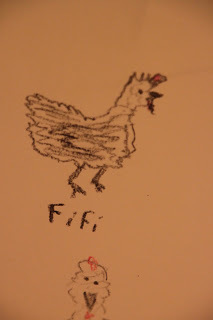 Fifi is broody for the very first time. She just celebrated her first birthday. 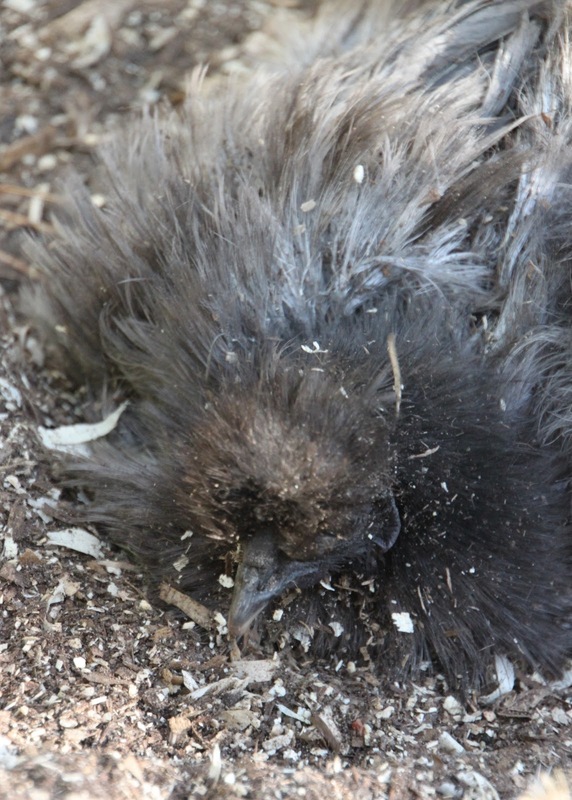 She has been in the nesting box for 3 days now and has plucked out all of her chest feathers. She is so adorable. 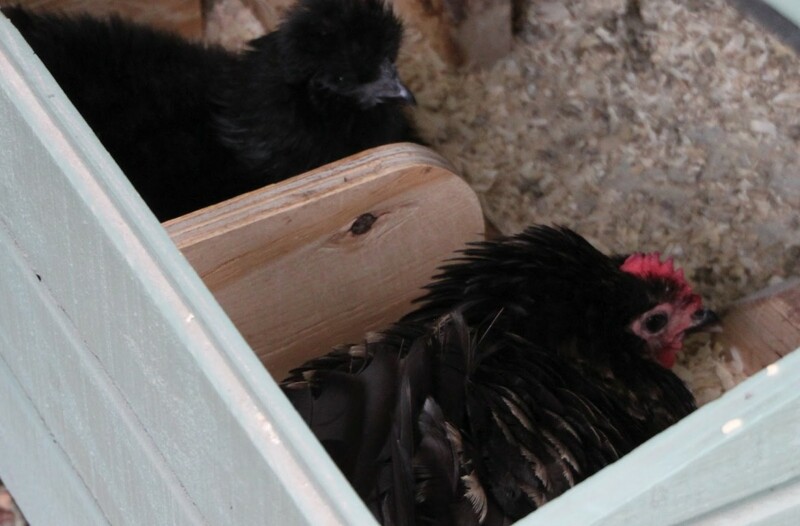 She has not quite realized that other girls are laying warm eggs in the boxes next to her. My older, professional broody girls, Dolly, Feathers and Autumn, can roll fresh eggs from another box to their box, secretly stealing other’s eggs to make a clutch of their own. I just love it when she lets out a quiet low growl when I open the nesting box to check for eggs. My children love to draw. Sometimes, they like to sit back and watch my husband draw things for them. Many times these involve drawing aliens and animals. 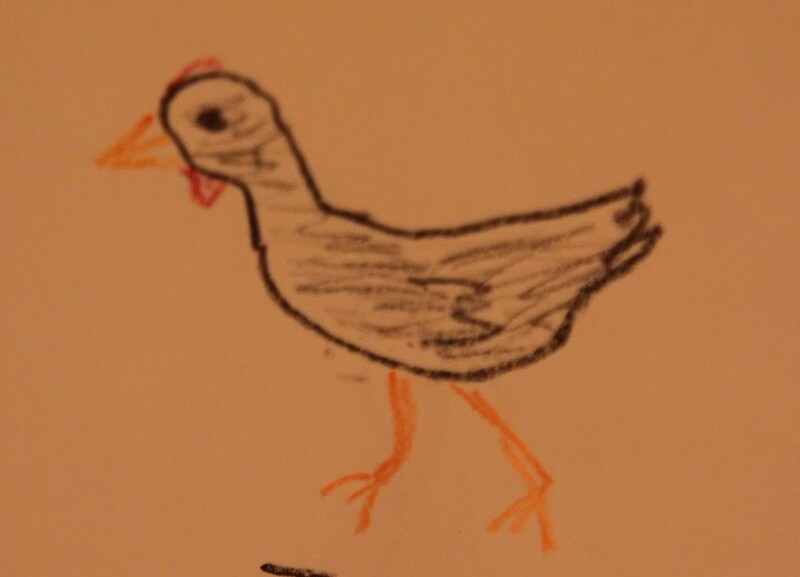 I can remember one day, my kids asked him to draw lots of animals. When he completed drawing everything that came to their minds, the kids asked him to go back and put a goatee on all of the animals. When he draws aliens, they come up with the most clever names related to some foreign appendage that is hanging from their body. 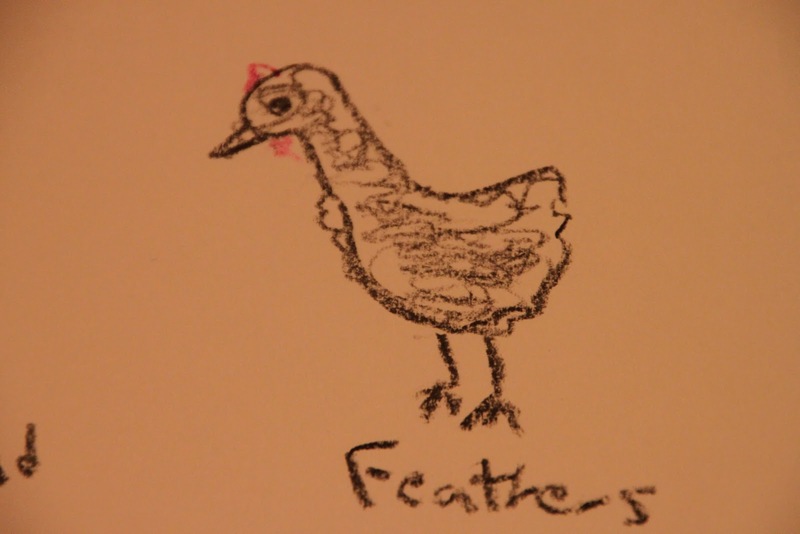 Well, last night, as I was busy filling calendar orders, little did I know that they were downstairs drawing our chickens. It was my daughter’s idea. 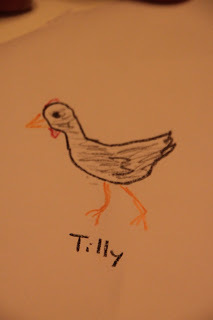 Tilly came first. Then came Sunshine and Oyster Cracker, our inseparable Buff Orpingtons. 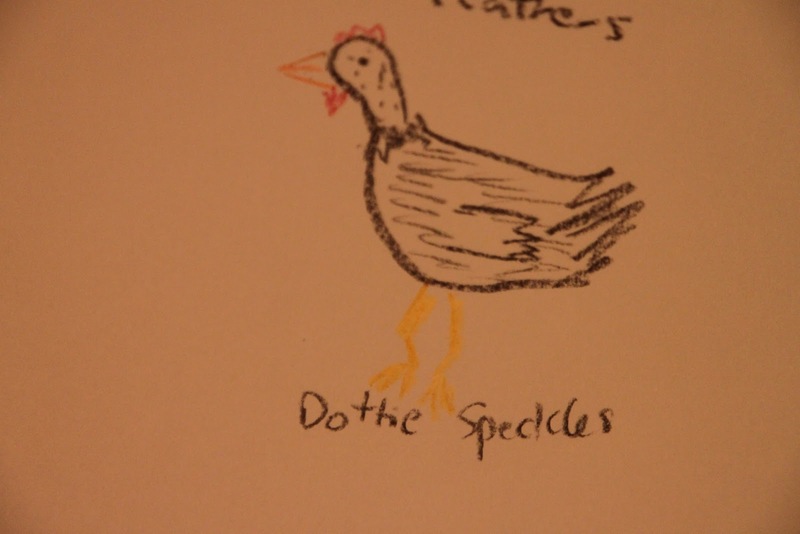 My husband, confessed that Dottie Speckles was the most difficult to draw. Of course, he captured the Silkies too, my daughter would not have it any other way. 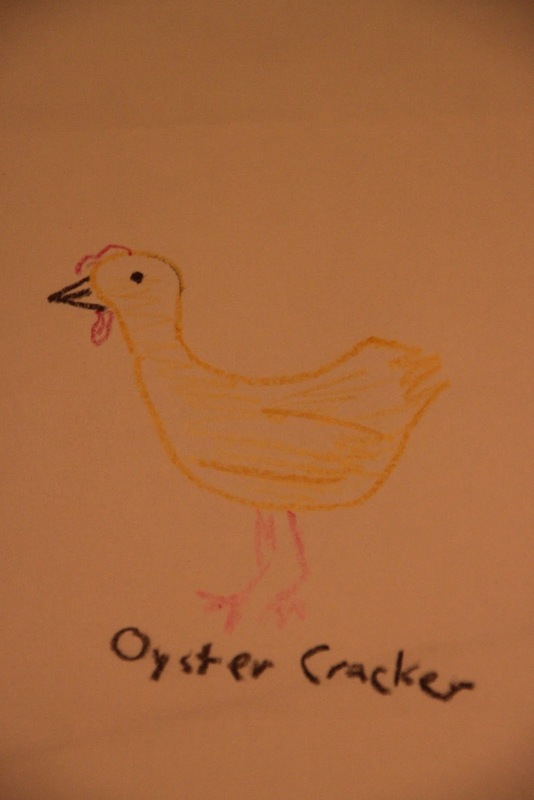 He was under specific instructions to write out the ENTIRE name of each chicken. 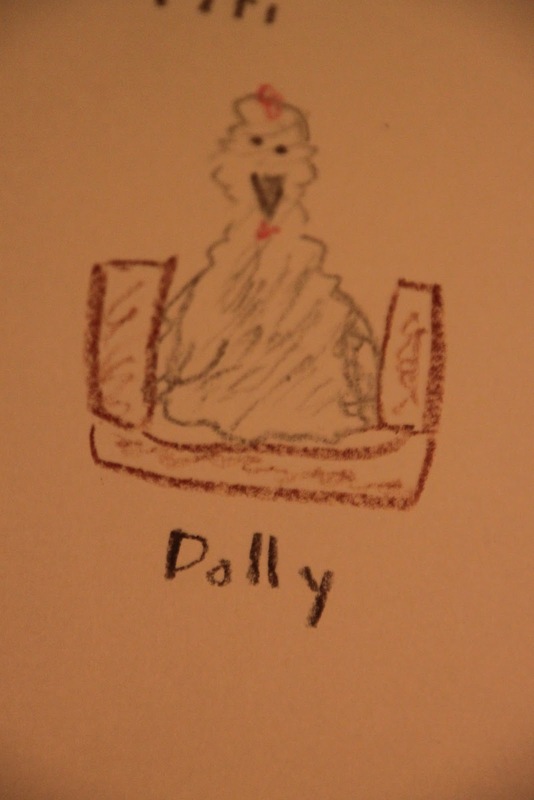 But my favorite, is how my daughter asked my husband to draw Dolly; broody in a nesting box. My husband doesn’t think he is a very good artist. The kids and I beg to differ. Would you be so kind, and vote daily for our tree? Melissa C. #20. Fifi is over being broody! 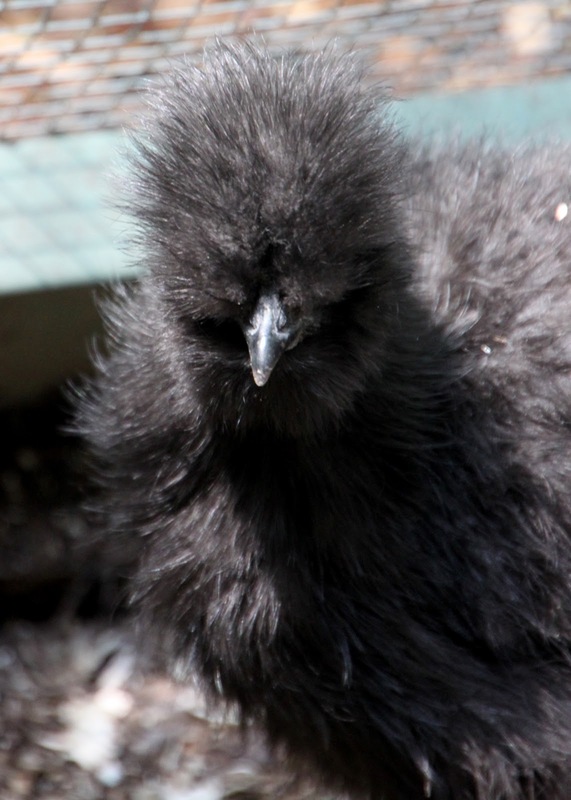 It seems as though this little fluff ball had been broody for over a month. During these past couple of days, I could see the veil lifting. 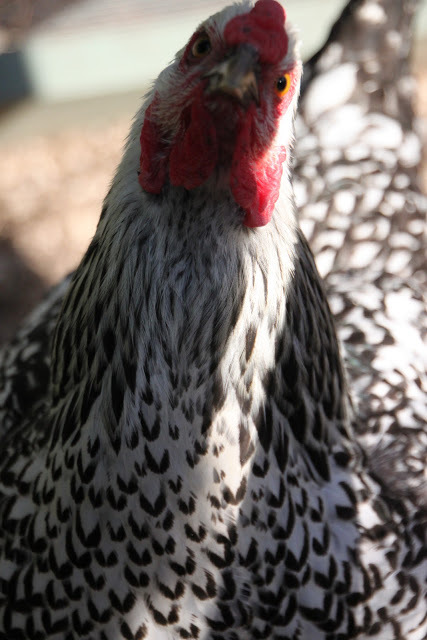 She has been first with Feathers to jump out the coop door in the morning and I began to find her spending more time in the run and less time in the nesting boxes. I felt so happy and relieved. 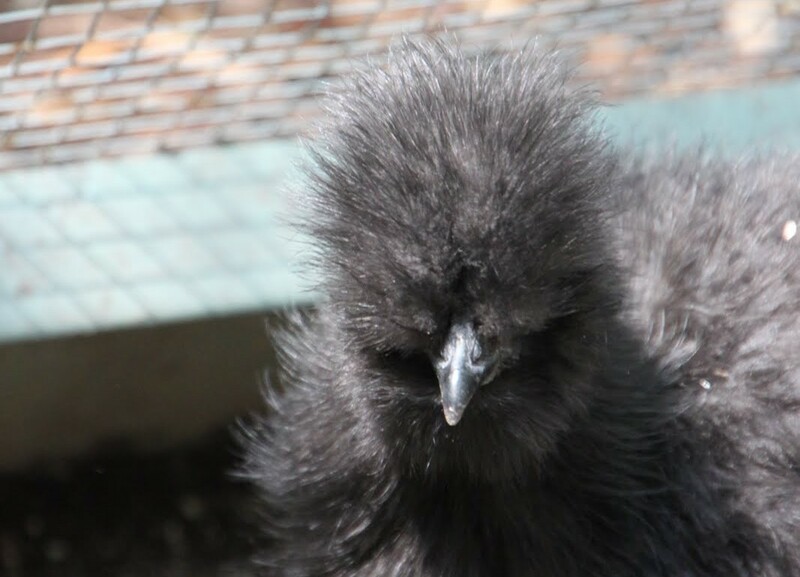 I always get nervous when the Silkies go broody. 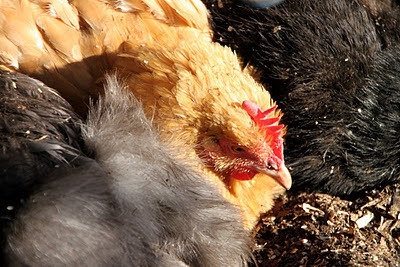 They seem to be broody all the time and being broody is not easy on their bodies. They eat very little and spend most of their time in a zen like trance that is sometimes difficult to get past. 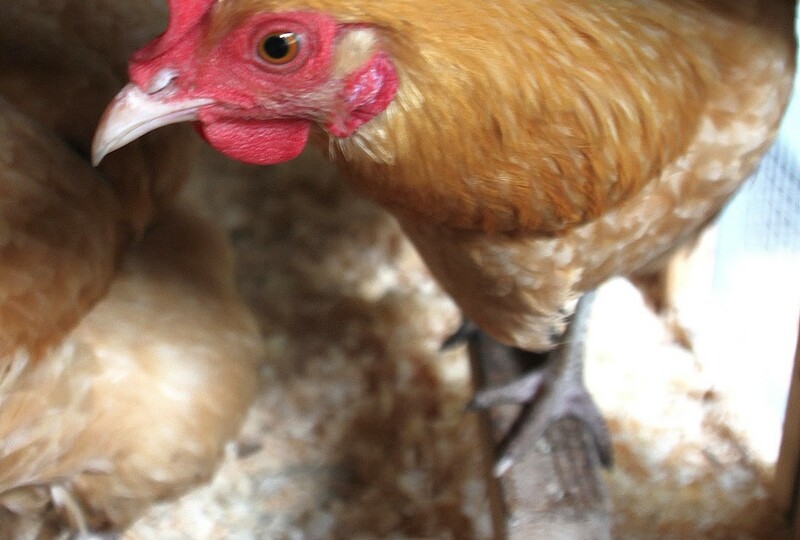 When I find them broody, I like to reach into their nesting box a couple times per day, scoop them up and force them to stretch their legs out in the run. Whenever I do this, it is like they are stunned. It takes them a minute to realize what is happening, who they are with and what exactly I am doing. 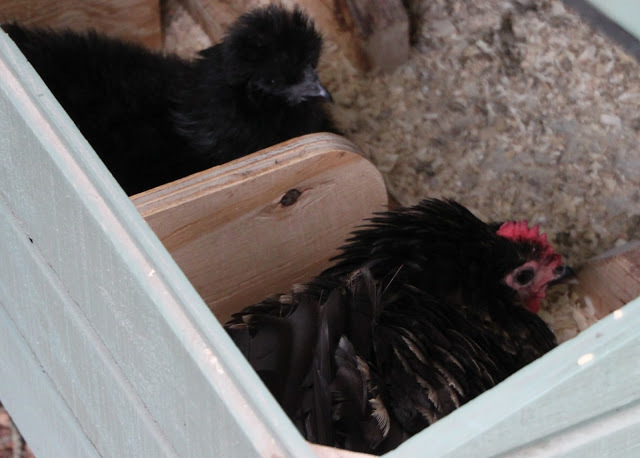 As soon as they realize, I barely have time to return and close the nesting box lid and vooomp, the broody girl has returned. 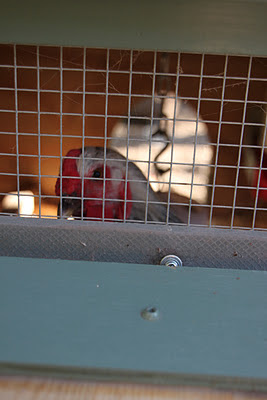 Imagine my surprise today when I went out late morning to give the girls their treats and Dolly was in the nesting box. Like clockwork, she is dialed in to broodiness, every other month. It was easy to confirm. I lifted her up and found a colorful assortment of three eggs underneath her breast. I am coming to the realization that this is just who she is and how her body works. It makes me feel like I understand her and in someways, love her more for it. 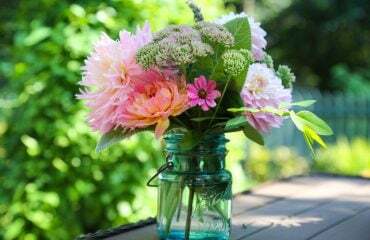 I returned inside the house and continued on with my day. Later in the afternoon, I fed the girls some scratch. The weather was getting cooler as the sun was setting. I took Dolly out of her box and let her enjoy the treat with the others. 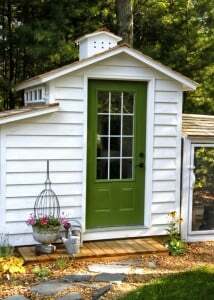 Once nightfall arrived, I went out to lock up the coop. I was in for a real surprise. I opened up the nesting box door, expecting to shoo Dottie Speckles out and there I found it. Three girls, including Oyster Cracker were inside all three of the boxes. I first gently shooed Oyster Cracker out of the left box. 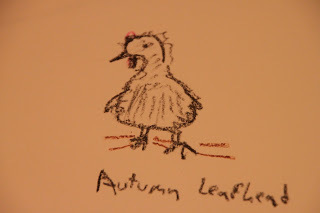 She groggily left and walked off toward the favorite roost. In the middle box, I found Fifi. She was sound asleep so I picked her up and guided her feet to the vacant roosting bar. In the right box, I found Feathers. She too was sound asleep and stirred as I guided her next to her sister. 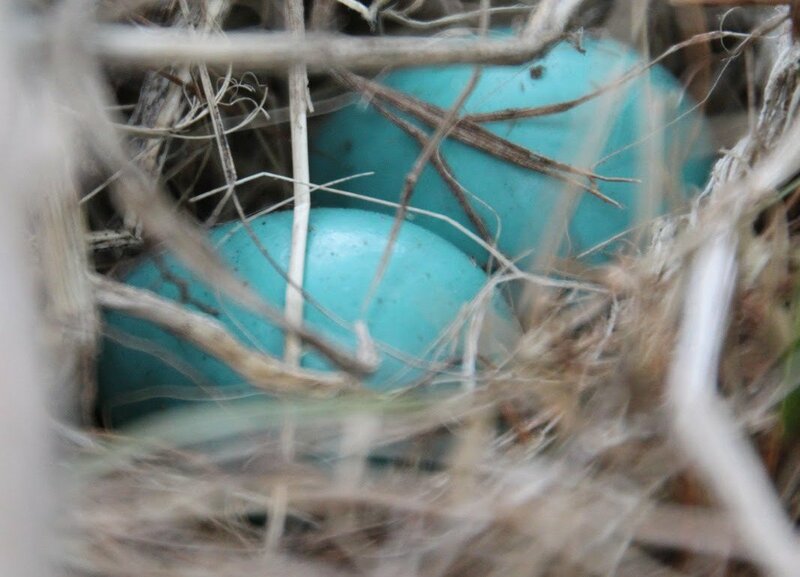 Then, in darkness, I blindly felt in each nesting box for any eggs that had been laid between the afternoon and now. 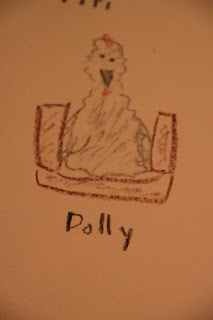 When I got to the box on the left where Oyster Cracker had been, there I found Dolly. Oyster Cracker had been sitting on top of her! I scooped her up as well and then placed her next to her fluffy Silkie sisters. Just when I think I have them figured out, they change their behavior. Tonight, it was like a clown car at the circus. 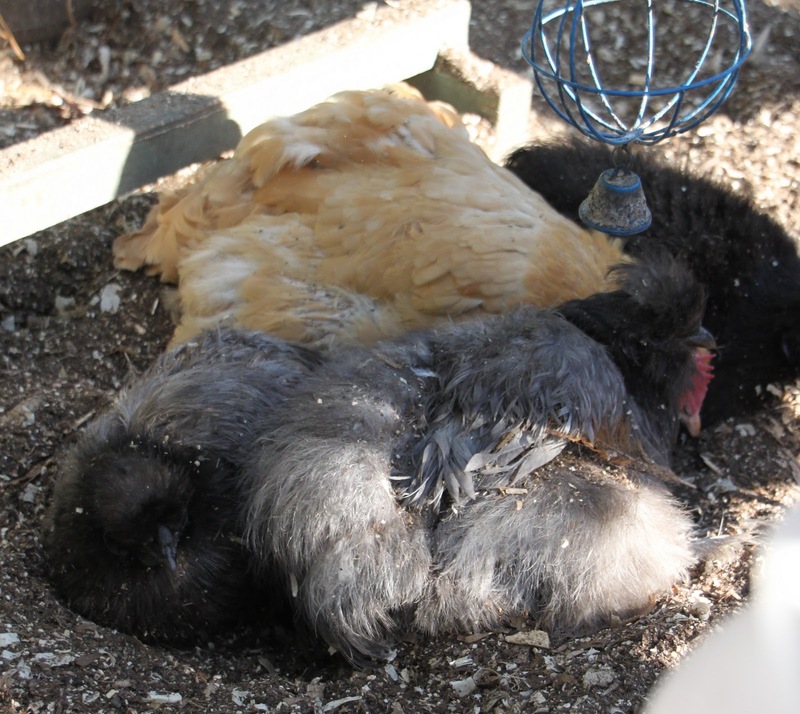 The one expected chicken who like to sleep in the nesting boxes wasn’t there but four different ones were. 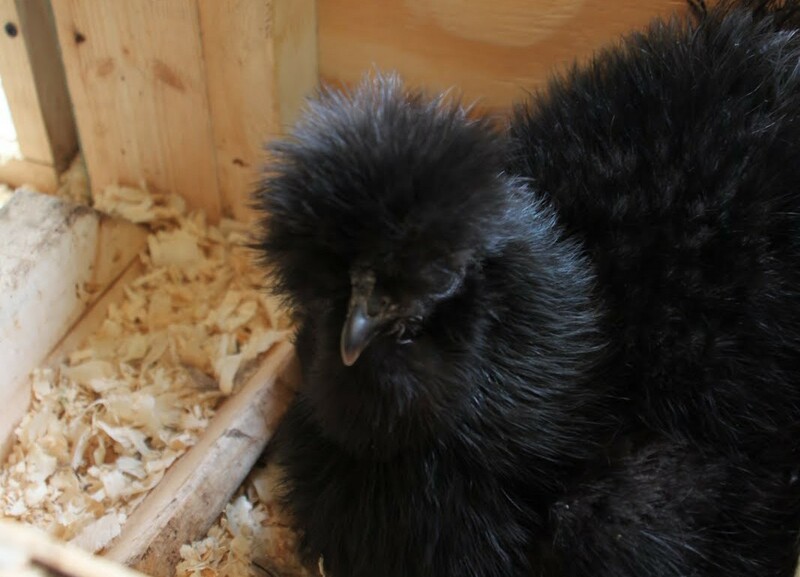 The hen who was supposed to be broody decided today that another Silkie, Dolly, should now assume that role. 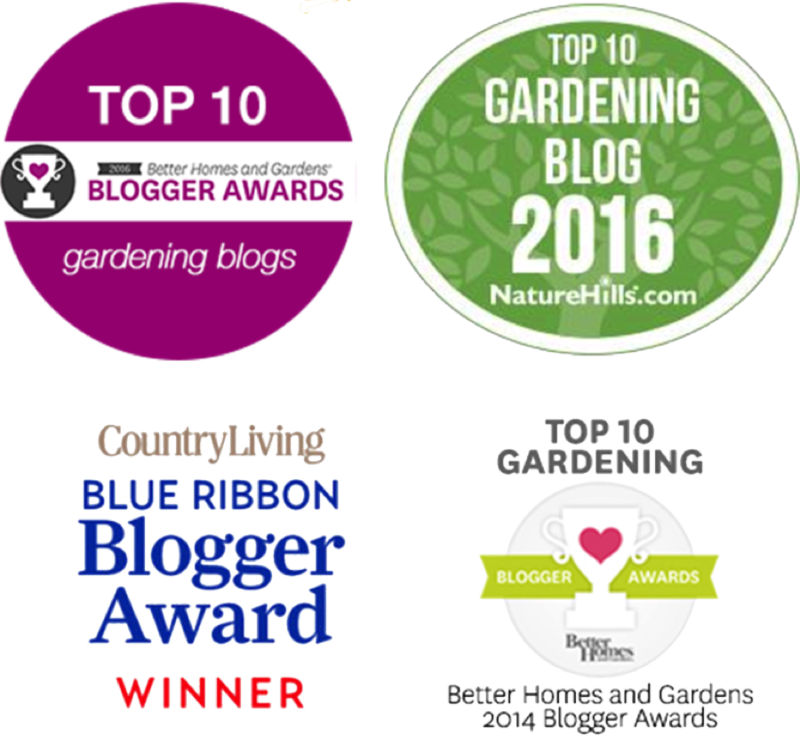 This post is linked up to Deborah Jean’s Dandelion House Farmgirl Friday Hop. Yesterday, I had the pleasure of meeting Joel from the Woods Hole NPR station. 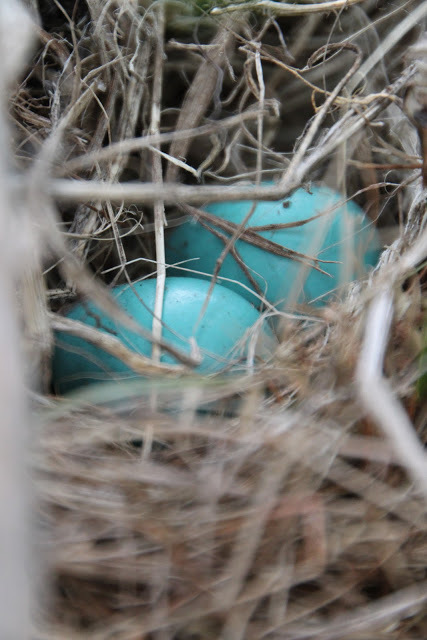 I had received an email that she had discovered the blog and was interested in doing a radio piece on the girls of Tilly’s Nest. She came across us while researching farming on Cape Cod. We reviewed our schedules, arranged a time and met yesterday morning. It was a glorious sunny day. We reached temperatures in the mid 60s. 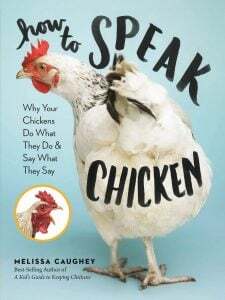 Joel, who is a chicken keeper herself, arrived mid-morning with a microphone and a tape recorder. 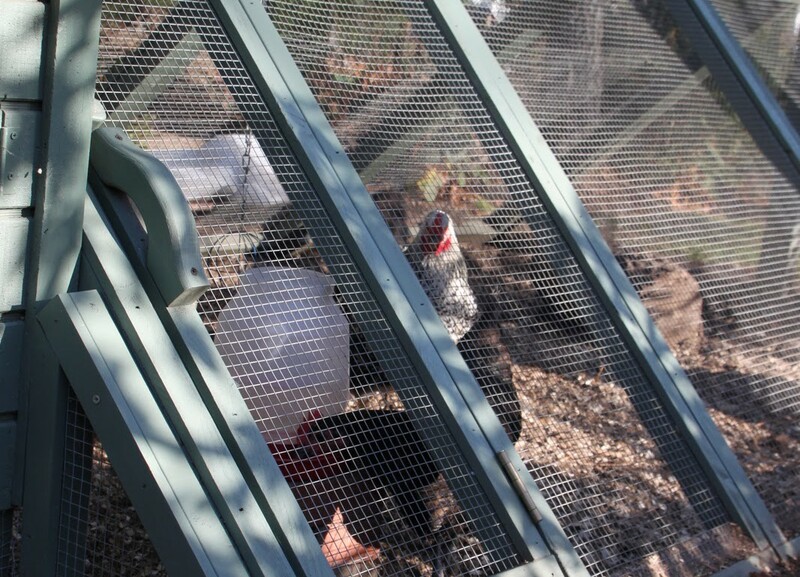 First, we went over to the coop to meet the girls. Of course, as expected, Tilly was a microphone hog! 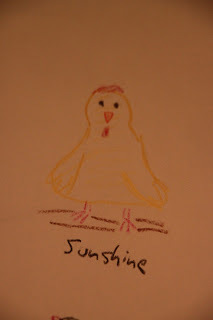 She is always the chicken who has so much to say and yesterday she did not let me down. In fact, all of the girls were their usual delightful selves; chatting up a storm. Joel captured the dialogue. Crouched down at chicken level, I introduced her to all of the girls one by one in detail. Soon enough, we ventured inside away from any background noise. We had a lovely conversation. It was informal and relaxed, despite knowing I was being recorded. It was easy. My initial nerves were replaced with comfort as I began to talk about my feathered girls. She asked me some typical questions as well as a few unexpected ones. We spent two hours together. It was nice. Before Joel left, we revisited the girls. She wanted to record them talking one last time. People are always surprised when they hear the girls. Since they were a day old, I chatted with them. 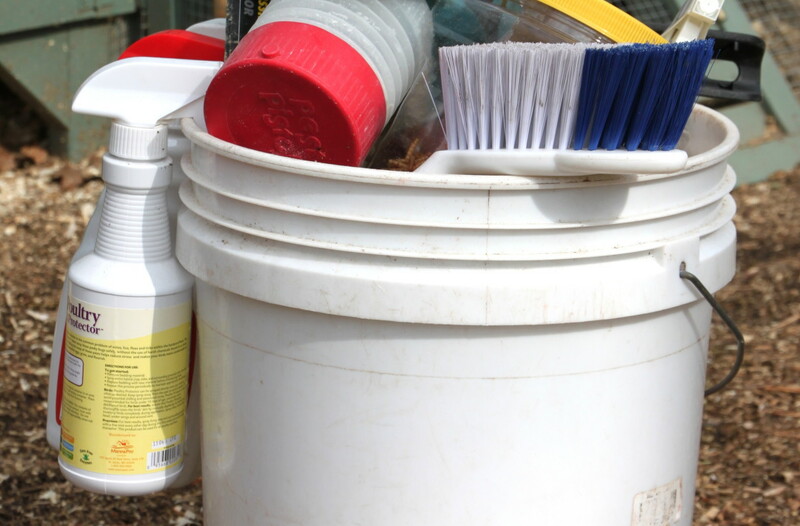 As I would sit on an old worn out comforter in front of the brooder our conversations began. I suppose they emulate what they learn, like our human children. 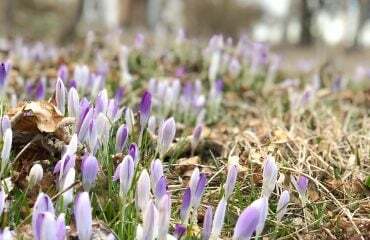 I felt proud of them. It is true that you get out of life what you put into it. They were friendly, for the most part well mannered and polite. 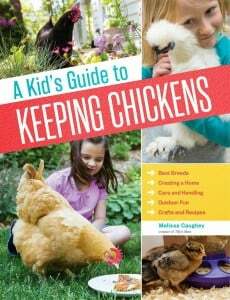 From the beginning, our family gave the chickens much love and attention. Yesterday, I realized that it had and does indeed make a difference. I’m not sure if our story will end up airing on NPR. It is still in a raw form that needs to be molded into some sort of airable piece. 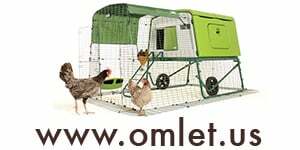 We could easily end up cut by an editor who needs to make room for something more exciting than backyard chickens. It doesn’t matter to me really. 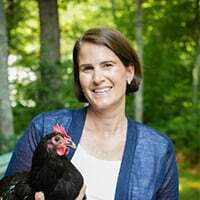 Sure, I would love to hear our piece in some form on NPR but the greater joy was knowing that I was able to connect with Joel and she was able to connect with Tilly, Oyster Cracker, Sunshine, Dottie Speckles, Dolly, Feathers, Autumn and Fifi.